Hungry ghosts are pitiable creatures. They have huge, empty stomachs, but their mouths are too small and their necks too thin to take in food. Sometimes they breathe fire; sometimes what food they do eat turns to ash in their mouths. They are doomed to live with incessant craving. The Hungry Ghost Realm is one of the Six Realms of Samsara, into which beings are reborn. Understood as a psychological rather than a physical state, hungry ghosts might be thought of as people with addictions, compulsions, and obsessions. Greed and jealousy lead to a life as a hungry ghost. Hungry ghost festivals are held in many Buddhist countries to give the poor creatures some relief. They are offered paper money (not real currency), food and diversions such as plays, dancing, and opera. Most of these festivals are held in the summer months, July and August. 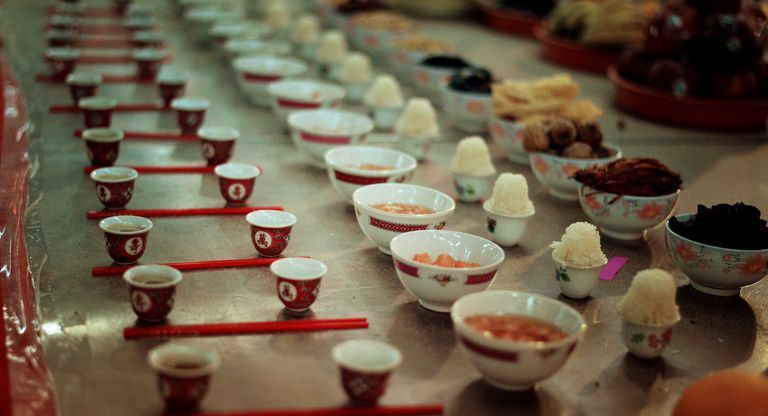 Hungry ghost festivals can be traced back to the Ullambana Sutra. In this sutra, the Buddha's disciple Mahamaudgalyayana learned that his mother had been reborn as a hungry ghost. He gave her a bowl of food, but before she could eat it the food became burning coals. Sorrowing, Mahamaudgalyayana went to the Buddha to learn what he could do for her. The Buddha told Maudgalyayana that on the 15th day of the 7th month, the sangha should fill clean basins with fruits and other food, along with offerings such as incense and candles. All those complete in the pure precepts and the virtue of the way should come together in a great assembly. The Buddha instructed the assembled sangha to place the basins in front of an altar and recite mantras and vows. Then seven generations of ancestors will be released from the lower realms — hungry ghost, animal, or hell — and they will receive the food in the basins and have blessings for a hundred years. A wealth of folklore and traditions have grown around hungry ghosts. In the Obon festivals of Japan, for example, paper lanterns are floated down rivers to symbolize the ancestors' return to the dead. In China, the dead are thought to visit their living relatives throughout the 7th month, and prayers and incense are offered to placate them. The dead also are gifted with fake paper money and other presents, like cars and houses, also made of paper and burned in bonfires. On festival days in China, often an outdoor altar is built to hold food offerings. Priests strike bells to summon the dead, followed by ​chanting by monks. Festival of the Sacred Tooth in Sri Lanka - Whose Tooth Is It?